PARiM has a separate Client portal for your clients to log in and to see all the events and the shifts in their locations. Once you have added your clients and their locations into the system you can add the contact persons connected to the locations. Please read more about how to add contact persons here. You can give access to the Client portal when you are adding a new contact person or you can also give it to already added person by editing their information. 2. 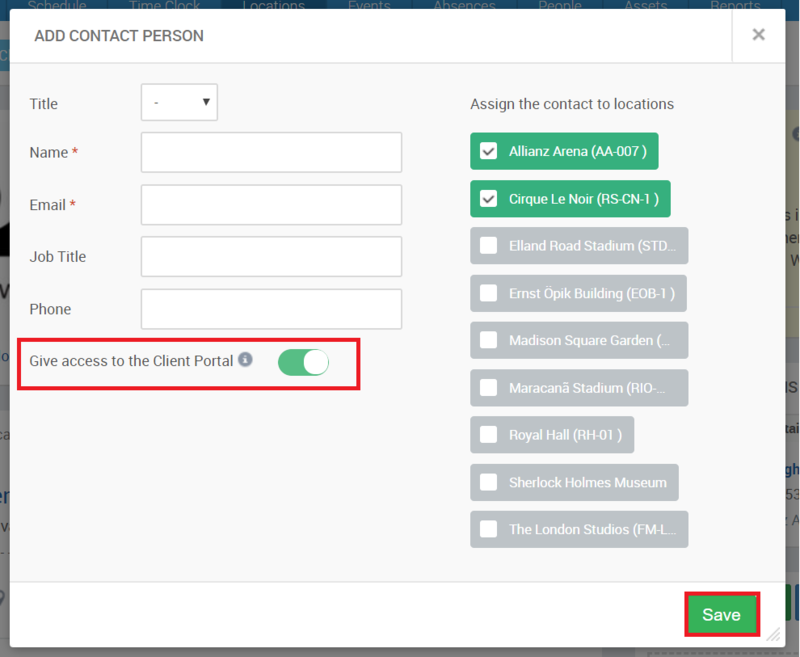 Giving access to the Client portal to already added contact person. Look up the contact person from the client profile from the client list under the 'Location' tab. Next, check if all the needed locations are linked to the person by clicking on the person´s name and after that give the person the access by simply switching 'ON* the access bar. Please note, it is important to select the locations which you want to give to the person. As one client can have many different locations and this allows you to choose which locations' information you want a specific contact person to see. They will see only the shifts for which locations they have been assigned to and are responsible for.